Oh, my! 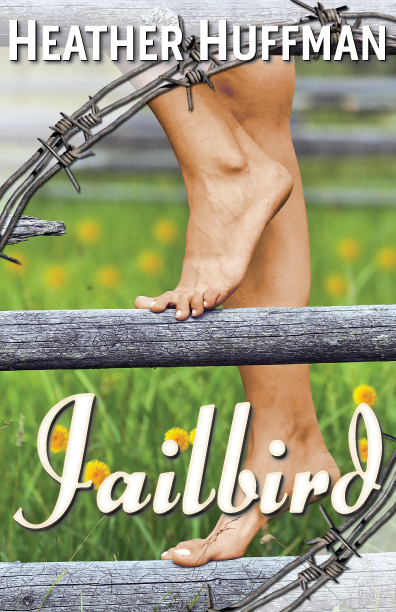 I absolutely loved Jailbird and Heather Huffman may be my new favorite author. I discovered her last summer when I was looking for free books for my then new Nook. I saw Throwaway on a book blog devoted to Nook deals and knew it was exactly the kind of book I'd enjoy. And enjoy it I did. You can see my review here. After reading it, I went looking for more of Heather's books. I was able to pick up Suddenly a Spy and Jailbird for free. A few weeks ago, I was contacted about hosting Heather as she promotes the upcoming sequel to Jailbird. I, of course, said yes. Heather will be here on Monday. I have been wanting to read these two books since I picked them up, but with all the review copies I just couldn't find the time. Now I had a excellent excuse to read Jailbird. And one Saturday that is just what I did. I was having a lazy day in bed and my Nook was on the bedside table where I had charged it overnight. The plan was just to finish the last chapter of the ebook I was reading and get up. Yeah, well... I enjoyed being lazy and thought I'll just open the file and read the first chapter of Jailbird. A few hours later I finally had to get up to eat and I was a fair way into the book. I could have just read the entire book right then. I had things to do and decided my reward for getting my to do list done would be to read more of Jailbird. As many of you know I don't read on my Nook typically when I'm at home, but I just couldn't stay away from the story. I did wind up finishing the whole book in one day. The story flows so easily that you don't realize you've blown through several chapters until something (a grumbling stomach in my case) draws your attention. I love Heather's books because she deals with gritty topics, but her books always have a shining light in them. Jailbird starts right off with Kali running away from prison. You don't know why she's in prison, but within a few pages you are hoping she was wrongly accused or something because you will be rooting for her. You do find out she's in prison on a felony conviction. She killed a rich white guy and Kali happens to be from the Native American reservation. Neena (Kali) finds herself in a small town where a Hispanic family helps her get a second chance. Life is looking good for her, but you know how the past has a way of catching up with you. I live in the south and know how the good ol' boy system works. I was biting my nails wondering if Charlie and Neena could fight against it and win. Oh... Charlie. You know when I read The Egyptian (review here) and I said I had a crush? Well if Dominic was my crush, Charlie would be the one I fell in love with. He so loves Neena and he is so super sweet. Neena is a little jumpy and he is so understanding with her. Their courtship is what every romantic wants. I wish I could tell you what really made me fall in love with him, but I don't want to give away too much of the story. You must get this book! For how much I loved Throwaway, I think I loved Jailbird more. The ebook is only 99 cents, which I think is an incredibly great deal for such a good story. I also want to mention I love the new cover. The ebook I got last summer has a different cover, the cover above is for the new edition that came out at the end of 2011. I think this new cover is much more eye-catching. Your turn: Do you enjoy books that touch on gritty subjects? Or do you prefer lighter reads? Please remember to stop by on Monday for a guest post from Heather about her new project Devil in Disguise.